Johnstown Mennonite Mission in Johnstown, Pennsylvania in August 1951. The Johnstown First Mennonite Church was founded in 1939 as the Johnstown Mennonite Mission under the district mission board of the Southwestern Pennsylvania Mennonite Conference (later known as Allegheny Mennonite Conference). The services were held in rented dwelling houses until 1949. In 1945 a lot with house was purchased close to the center of the city; the house was converted into a parsonage. A brick meeting house was built on an adjoining lot, and dedicated in 1949. The membership was 66 in 1955 with John E. Gingrich as pastor and bishop. In 2005 the membership was 46. In 2015 the First Mennonite Church left the Allegheny Mennonite Conference. This move was part of a larger realignment of Mennonite congregations in the 2010s that were formerly part of Mennonite Church USA. These congregations were unhappy with Mennonite Church USA's failure to take stronger disciplinary actions against area conferences and congregations who expressed openness to inclusion of lesbian, gay, bisexual and transgender persons. 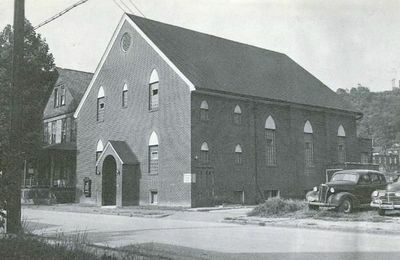 Gingrich, John E. "First Mennonite Church (Johnstown, Pennsylvania, USA)." Global Anabaptist Mennonite Encyclopedia Online. 1957. Web. 26 Apr 2019. http://gameo.org/index.php?title=First_Mennonite_Church_(Johnstown,_Pennsylvania,_USA)&oldid=161052. Gingrich, John E. (1957). First Mennonite Church (Johnstown, Pennsylvania, USA). Global Anabaptist Mennonite Encyclopedia Online. Retrieved 26 April 2019, from http://gameo.org/index.php?title=First_Mennonite_Church_(Johnstown,_Pennsylvania,_USA)&oldid=161052.